Usain Bolt, or Usain St Leo Bolt OJ CD, is a 31-year-old retired Jamaican sprinter and world record holder in the 100 metres, 200 metres and 4×100 metre relay. He is considered to be the fastest man on earth and is widely considered the greatest sprinter of all time thanks to his lengthy achievements. How old is Usain Bolt and where is he from? He was born on August 21 1986 in Sherwood Content, Jamaica. What age did Usain Bolt start running? At the age of 15, Bolt took his first shot at success on the world stage at the 2002 World Junior Championships in Kingston, Jamaica, where he won the 200-metre dash, making him the youngest world-junior gold medalist ever. How many Olympic medals did Usain Bolt win? Bolt won eight Olympic Gold Medals during his career. He won the 100m, 200m and 4×100m relay at three consecutive Olympic Games, although he lost the 2008 relay gold medal about nine years after due to a teammate’s doping disqualification. He gained worldwide fame for his double sprint victory at the 2008 Beijing Olympics in world record times, which made him the first person to hold both records since fully automatic time became mandatory. Bolt is the only sprinter to win Olympic 100m and 200m titles at three consecutive Olympics (2008, 2012 and 2016). How far did Usain Bolt throw javelin? Usain Bolt, never shying away from trying his hand at new sports, attempted a javelin throw while he was attending and competing in the Rio 2016 Olympic Games. He produced a throw of 56 metres inside the Olympic Stadium, a score that could rival the attempts of people who throw javelins regularly. Yes. Usain Bolt retired from international track events in 2017. Bolt could only manage bronze in his penultimate race, the men’s 100m at the World Championships in London, before sustaining an injury just as he began to hit top speed in his final event, the 4x100m relay. It meant the 19-time global champion, who was described by Lord Sebastian Coe as ‘a genius’ akin to boxing legend Muhammad Ali, bowed out in unfamiliar fashion. He was helped off the track by his teammates, barely able to stand upright. Does Usain Bolt have a child? No, but it was reported in 2017 that Usain and his girlfriend of four years, Kasi Bennett, were contemplating children. He posted on Instagram: ‘I have [had] a girlfriend for four years now [and] it’s going steadily, so we’re thinking about kids very soon’. How fast can Usain Bolt run mph? Bolt’s record was 44.72 km/h (27.8 mph), seen during the final 100m at the World Championships in Berlin on 16 August 2009. 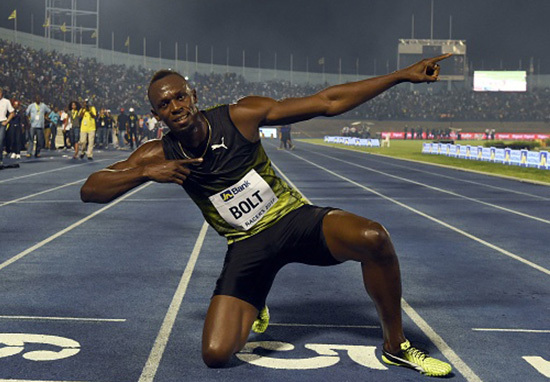 Bolt’s average speed over the course of this race was 37.58 km/h or 23.35 mph. How fast can Usain Bolt run a mile?? It has been reported that Bolt, the fastest man on earth, had never attempted to run a mile before. Speaking to The New Yorker, Bolt’s manager Ricky Simms wouldn’t confirm whether he thought Bolt could complete a mile in less than five minutes. 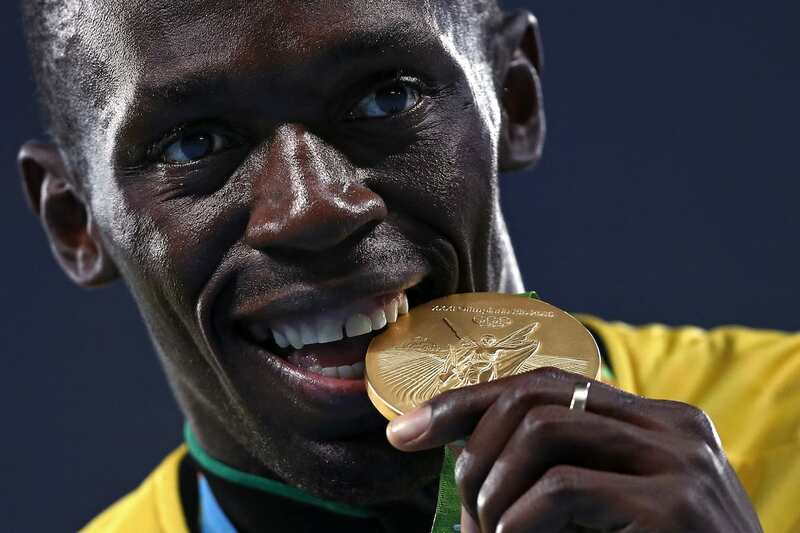 However, he confirmed that Bolt had never attempted to run that distance. In 2017, Celebrity Net Worth reported Usain Bolt was estimated to have a net worth $34.2 million. In 2016 Forbes pegged Bolt’s earnings at $32.5 million. According to CNBC, Bolt has been with Puma since 2002, joining the brand when the sprinter was just 16. Prior to the 2016 Olympics, the deal was paying him $10 million a year. Usain bolt is 6ft 5in tall. He reportedly sprung up when he was just 15 years old and he physically stood out among his peers. Does Usain Bolt like football? The retired sprinter has long expressed an interest in playing football and in 2017 he went and trained with German team Borussia Dortmund for three weeks. He said at the time that the trial was positive. In March 2018, he went through his first professional trial, scoring a goal. In April, it was announced he would be entering a second training trial with the club, while the club’s manager stated that he ‘still had a lot to learn’. In February 2018, Bolt and pop star Robbie Williams announced on social media that they would go head-to-head as captains in the eagerly anticipated Soccer Aid for UNICEF match, with Williams captaining England against the rest of the world.